Aaah Sentai movies, always an excuse to go hog wild with your budgets for a bit, though the first fight with Zyuden 0 got a bit... cluttered what with it being in a city and so many large CG dino-robots were flying around. Still, as cheesy as it looked I liked the CG fight between the two mechs at the end, I'm just that kinda nerd at times. Not, too sure if anyone else brought up this point... But in the museum video... So everyone's standing in front of the moving T-rex status, all of them calling attention to it but uh... Did Souji's actor really mess up and think it was a raptor or did they actually film that in front of a different, very similar looking moving dino model, or was everyone else wrong in thinking it was suppose to be a T-rex and he was right saying it was a raptor? ... Yea I know it's not important and maybe we'll never know but it caught my attention. I thought it was a small t-rex, but phurricane thought it was a raptor. So I don't know what to believe. 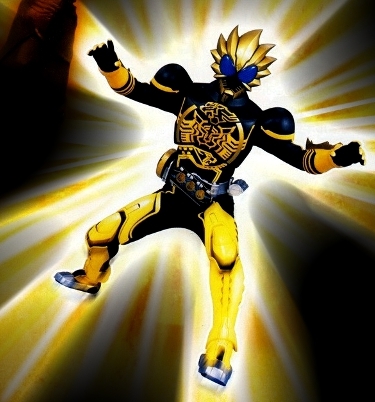 Kamen Rider: From Ryuki to Gaim. Abaranger, Hurricanger, Megaranger, Dairanger, Garo Makai Senki, Garo Yami wo Terasu mono, Drive, Ninninger. Raptor is a very generic term for a slew of different dinosaurs ranging in size from a couple of feet (60 centimetres) to 20 feet and above (6 metres). If raptor is used a shortened version of Velociraptor, then it's about the smaller ones, 6.8ft long and 1.6 ft high (2 metres in length and 0.5 metres high). Reminder, the "Raptors" we see in Jurrassic Park were actually Deinonychus when you compare their size. If you're interested in seeing more, please visit my deviantART page. Noticed an issue with ZyuDen Sentai Kyouryuuger Movie HD v2. There is a spacing issue with the subtitles at 25:36. Not sure if this is were I'm supposed to post this but I thought it would be the best place. Kamen Rider Gumo wrote: Possibly my favorite part was the SpinoDai-Oh Snapping Combination; the tune DeathRyuuger played was ALMOST (but not quite) the tune of DragonRanger's ZyuSouKen, which for me automatically made the rest of the movie awesome. Was just about to say that myself. It was a nice touch. Movie was too short. I felt like everything seemed so rush and I missed a lot of keypoints. By the time I was trying to catch up with everything, I realized the movie was going to end. The action was pretty cool though. Koichi Sakamoto has got that part of his work down well. Let's not forget the eye candy provided from the females here too since the Kyouryuuger team is one big sausage fest. Lol...I did chuckle seeing some of the Kamen Rider Wizard crew doing the dance in the end too. Dax wrote: Raptor is a very generic term for a slew of different dinosaurs ranging in size from a couple of feet (60 centimetres) to 20 feet and above (6 metres). Deinonychus are still velociraptors as they are in the velociraptorinae subfamily, even though they aren't in the velociraptor genus. In the same sense that Pumas and house cats are both felines, even though only house cats are in the felis genus, or how gorillas are still hominids, even though they aren't in the hominini genus like chimps and humans. The generic "raptor" term can really refer to any dinosaur in the Dromaeosauridae family. Henshin a go go baby! None of this answers if the moving statue was actually a T-Rex or Raptor. WHO WAS RIGHT? KING OR SOUJI? Souji. That's definitely a raptor. Though there's also a moving T-Rex near the entrance as seen in the movie. It's probably the biggest attraction at the museum as far as moving dinosaurs go, so King and Ian may have just been referring to that. There's no way that tiny thing with the beefy arms is a tyrannosaur. T.rex couldn't win an arm wrassle if its life depended on it. Quote: "We cannot change the past, for it is written in stone. So we look to the future, for it has yet to be written." The movie was nothing more than an extra episode with the length it has, but as such, it's still entertaining. If Toei was to leave in the cut material, they could have had at least maybe 40 minute movie, which is nearly two episodes worth of time. Sad that they couldn't. But the Museum footage was pretty funny. Seeing the actors out of character was interesting and I was really kind of hoping that Torin was there to give his insight on how he liked it. As for the animatronic dinosaur, tiny-Rex or Raptor, still nice. I think I'll go with Souji and say it's a raptor just because he looked down *which is out of screen for us* so it probably has a plate that has Raptor there for pedestrians. Fun little show, liked how Haruto and his crew showed up to dance. With that, onto ToQger. I liked the movie for what it was but also thought (as everyone else has stated) that it felt really rushed. The Dino Soul song was great. For those curious, the animatronic dino is a Fukuiraptor. Here's Fukui Prefectural Dinosaur Museum's page on Fuikuiraptors but this site was more useful in naming the animatronic.